Before you make any changes to your home, I feel strongly that you must begin to read your meter and track your usage. You can do a lot to save electricity, but if you aren’t quantifying your progress until you get your bill at the end of the month, you’re missing out completely. Daily tracking of how much power you’re using in a 24-hour period is paramount! Start in a spreadsheet or just a piece of paper hanging on the frig, but start tracking your daily usage! Check your meter at about the same time every day. Determine what your average usage is for each day of the week and notice the days when you used more or less. For example, our usage on weekends is usually a bit higher because the kids are home. That’s going to happen. During the holidays, when family is in from out of town, it’s going to be higher. But I’m in charge of the situation because I’m aware of it! During the day, when everyone is out of the house but me, I turn everything off or down. I habitually wear a scarf around my neck and maybe even a hat, so that I can comfortably keep the heat down a bit lower in the winter. Tracking is the only way you can truly get a handle on your utility bills! Here’s how to read your meter. Old windows can be a nightmare when it comes to saving money on your utility bill! Few of us can afford new windows, and still others of us rent so that it isn’t an option. Here’s what you can do to reduce drafts coming through your windows. Bubble wrap them! This is a low cost, reusable way to seal up your windows! You simply need bubble wrap, water and packing tape. When warm weather resumes, you can put the bubble wrap away and use it again next year. Bubble wrap isn’t cheap, so ask around for some, especially from people who work in offices. Maybe post something on a “Buy Nothing” page on Facebook, or your regular social media pages. Someone usually has bubble wrap laying around! I prefer the bubble wrap method over the plastic sheeting method, however, use what you can get your hands on. 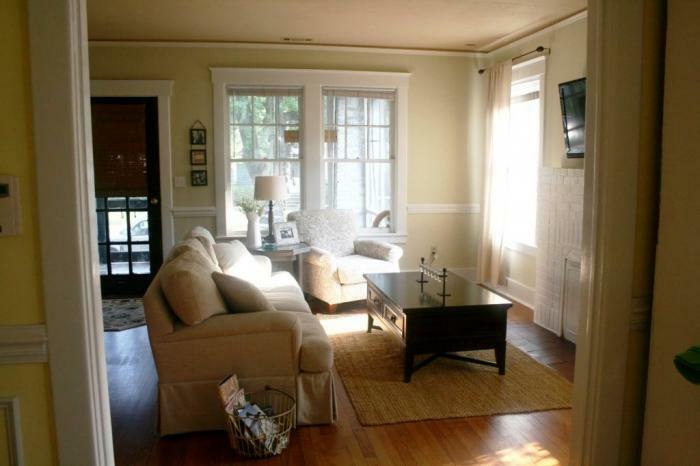 Remember that your south-facing windows can be a good source of sunlight, and hence heat. 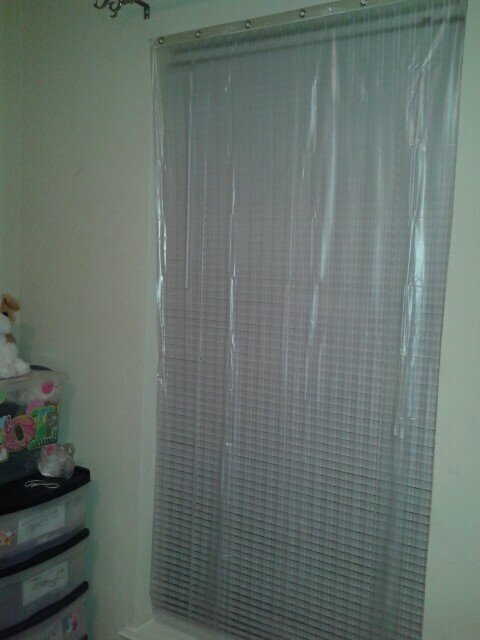 Using clear bubble wrap or shrink wrap will still allow the sunlight to come in, so don’t block the light from those windows during the day. Many times, we lose precious heating and cooling because the doors of the home are opened and closed repeatedly during the day. Sliding glass doors are notorious for allowing warm air to escape! If they’re not truly necessary in the winter, seal them off with the bubble wrap or shrink wrap until Spring. This might mean taking the dog out another entrance, but it’s only temporary. Having only once entrance allows you to keep watch over that door to make sure it’s closed quickly. Otherwise, it’s very easy to lose heat to well-meaning family members who will open any door, any time! Even if you reduce your home to one entrance, it’s still important to seal that door up tight! Make sure you don’t have any drafts coming in anywhere! Weather stripping can be used around your doors to close off drafts very effectively! It’s pretty inexpensive at your local hardware store. Personally, our front door was not hung correctly and is a bit off square. So, I used denim and quilt batting to make my own and staple-gunned it into the door jam. It works perfectly! If you’re tight on money, this might be a good idea to try first. 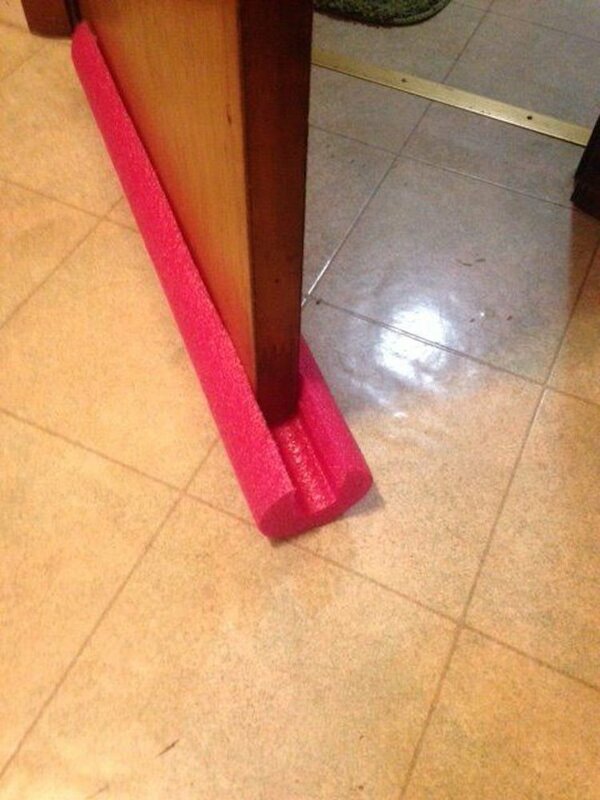 The bottom of your door can allow drafts as well, so get that blocked off! You can do this pretty inexpensively, here’s a couple of easy ideas. You can make a super effective, but equally adorable draft stopper out of old socks! 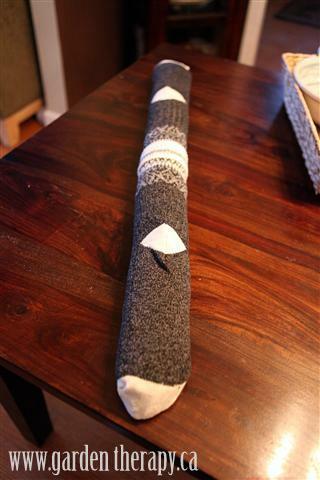 Or you can make one out of pool noodles! Once you get the drafts under control, you should be able to turn your thermostat down and still be reasonably comfortable. 68 degrees during the day is plenty and 65 at night will keep your bill down. Wearing a scarf or a hat around the house for an extra layer of warmth is a great idea, I certainly do it! Put flannel sheets on your beds, they go a long way to keep the heat in at bedtime. If you’re like me, you have hot-blooded teenagers who walk around the house in shorts during the winter months. I will NOT turn up the heat when they complain of being cold. It’s WINTER, people! Everyone in our family is expected to have a couple of layers on, because complaining won’t work. People need to adjust to the weather, not the other way around! You can also find it referred to as vampire energy, leaking energy, wall warts, standby loss, idle current, phantom power, ghost load and vampire load. The terms refers to the electricity many gadgets and appliances waste just by being plugged in (even if they’re switched off). After all, what do you think your cell-phone charger does all day while it’s plugged into the wall? If it’s warm when you get home from work, then it’s been using electricity – even if it had nothing to charge! The very best remedy for this is to simply unplug items that aren’t being used. Simple. One and done. I do this all the time, and it’s really just a habit that you need to create. 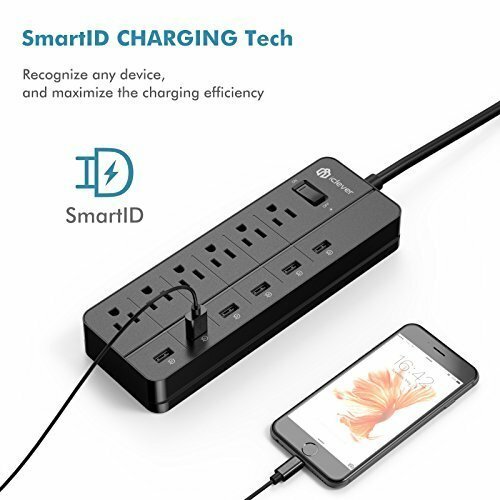 Power strips (surge protectors) can help as well for places in your home where several devices might could be charged/used together. Be sure to switch the power strip off when not in use and at night! I use these in my teenagers rooms as well as in the living room. Rather than buy these (they are a little pricey), many times offices have these laying around un-used in drawers. Ask around and again, check your “Buy Nothing” Facebook page and try to score one or two for free. For the appliances that use 220 volts, like the oven and the dryer, that aren’t easily unplugged, I walk out to the breaker box and turn the breaker for that appliance OFF. Think about it, how many times during the day do you use your oven? Probably not that often. Sometimes not at all. You realize it’s sucking energy though, right? I like to use my oven/stove in the morning and cook everything that I was planning to cook that day. Once the oven has heated up, why not use all of that heat? Rather than turning it off, and then turning it back on again? It has to heat up all over again and that costs money! Use your residual heat to continue cooking until you’re finished. Then, leave the oven door open (not with little ones in the house, though) and enjoy the residual heat! (I am in no way suggesting that you heat your house with the oven, just that you take advantage of the heat you’ve already created and paid for). I started doing this when I heard that women in third world countries light a fire in the morning and do all of their cooking for the day. It’s not easy to get a good fire going, and I can’t imagine that any of them used up precious firewood to repeatedly light a fire every time they wanted a cup of coffee! When it’s hot in the summer time, why not create a way to cook outside??? This can be a grill of some kind or even a solar oven! We use both in the summer, and they serve two purposes. First, they keep the heat outside where it belongs in July! 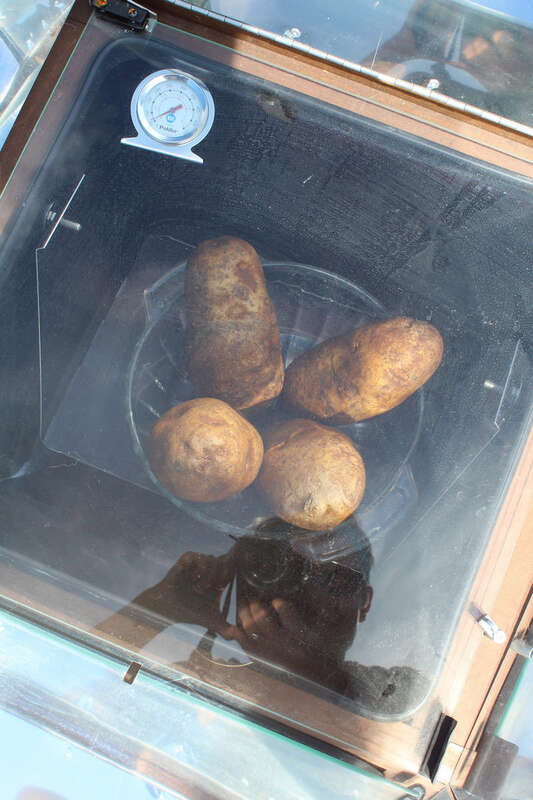 But secondly, they serve as an off-grid method of cooking should a long term power-outage happen. I highly encourage you to visit your electric company’s website and take advantage of their energy savings programs. Our electric company offers discounts for businesses and residences, everything from discounted LED bulbs to rebates on energy saving appliances and more! It’s worth checking it out, especially if you can get them to pay for some of the improvements your home needs! BE CAREFUL of predatory payments plans! I know of people who have gotten themselves into quite a mess, something like “Pay Day” loans, with their power company. Do your homework before committing and get some outside advice. Many times, cold air comes straight into our homes from the electrical outlets. Stand by one of your outlets that faces an outside wall and see if you can feel cold air. Some people even light a candle or a match to see if it blows out. If you can definitely feel cold air coming in, you can remedy that with a can of insulating foam from the hardware store. Here’s a video demonstration. My kids are great ones to close their bedroom blinds and then turn on the light. Ugh! I’m forever telling them “Use the sunlight, it’s FREE!”. But the same goes for us! Why NOT use the sunlight to our advantage? The Amish have done this for centuries. They do their mending and sewing when the sun is at it’s peak and shining through their windows! It got me to thinking about all the times I hit the light switch, if it’s really necessary. For example, do I really need to turn the light on in my bathroom when I need to use the potty? I mean, I know my bathroom pretty well, and even though it’s dark, I could probably get through it without a light. It’s just a few minutes of savings, but still, it all adds up. Now, if I’m taking a shower, that would be different, however, I still turn the light off immediately after I turn the shower water off. Why? Well, it’s just not necessary anymore. I can see well enough to get dressed and finish up. Last month, I moved all of my sewing equipment from the basement up to the great room area and set up for winter sewing, primarily because of the lighting. The sun shines all through my great room for most of the day, why would I spend money to power a craft lamp? Plus, the natural light is easier on my eyes. Just simple changes like this can save time and money! Install low flow shower heads in your bathrooms! They are pretty reasonably priced and save a ton on water. Don’t ever let water run while you brush your teeth or do dishes. Be mindful of how much is going down the drain. There’s an old saying for toilet flushing, “If it’s yellow, let it mellow. If it’s brown, flush it down”. We have low flow toilets, but flushing only when necessary helps save even more water. Finally, when the kids are gone to school is a time when I can get radical with energy savings. I can turn the heat down a little more, keep the TV and computers off and light some candles. I have about 7 hours a day to run the house on very limited energy, without anyone to complain about it. Add that to 8 hours of sleeping time and that’s 15 hours a day that you can really make a difference!